The Batavia Depot Museum has many exhibits that delve into the rich history of the town. Here you will find a list of some of our additional exhibits from trains to schools. Above is a list of a few more exhibits that the Depot Museum has to offer. Click on their titles to learn more. This Chicago, Burlington, and Quincy Railroad Caboose #14662 was built in the Aurora shops in 1907 and was retired in 1973. Moved to the museum campus in 1974, it was opened for viewing in 1994 with exhibits about the way men lived on the road. 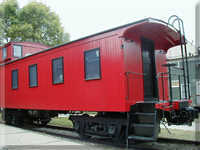 The caboose was the working headquarters of the conductor and the rear brakeman. It was equipped with closets, a stove, desks, bunks, and lockers that were long boxes with hinged lids on each side of the car and covered with flat cushions to serve as seats or cots. It was the job of the men on the caboose to watch the brake system air pressure gauge and for hot boxes. The men checked for the hot boxes by watching out the windows of the cupola. The opened and closed switches and kept way-bill records for each freight car. They cleaned and refilled kerosine marker lights and hand lanterns. A very important job was the protection of the rear of the train when it stopped. A brakeman/flagman walked out along way behind the train with a lantern or flag to stop another train approaching on the same track. These men “rode the rails” and did these jobs until the 1970s. If a train trip took more than a few hours, the men ate and slept in the caboose. They could make their own coffee on the stove and would buy food from farms along the way for the meals they prepared in the caboose.